My goodness, what a great issue. For starters, even though I feel like I’m repeating myself whenever I point out that Chris Samnee somehow keeps getting better and better, this issue is a perfect example of what I mean. There are so many scenes and panels in this issue that I absolutely adored, to the point where I may have to do another one of my “revisited” posts to talk about all of them. Even so, this review is bound to have an unusual number of panels from this week’s issue. To give this issue the full treatment it deserves, I will also be talking about how it ends (and yup, that’s the final page at the very end of the post), so beware of serious spoilers! Fortunately, most of you will have read the issue by now since I got delayed (twice) in putting it up, but if you haven’t, check back later! The issue begins where Daredevil #9 left off, with our hero curled into a fetal position under a bridge. Not a nice position to be in physically, and even less so when it’s mirrored by Matt’s mental state which gets a very thorough and thoughtful treatment over a number of pages. 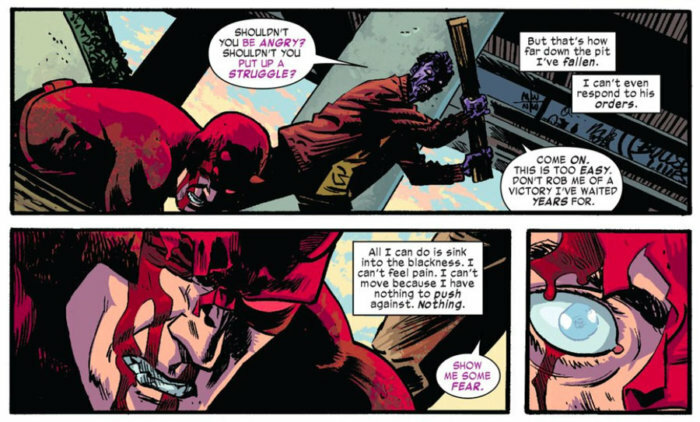 Mark Waid elegantly describes, through the inner monologue of Matt Murdock, how depression, not unlike a living thing, can take over and feed on a person’s darker moods. And Matt himself was just hit by a massive dose of dark moods, courtesy of the Purple Children’s influence last issue. An outraged Purple Man repeatedly beats a mentally broken Daredevil who can’t even compose himself to fight back. Until Killgrave utters the magic word, that is. It’s an interesting reflectionon on the character that it’s the notion of “fear” that sets him off and prompts him to defend himself. He’s the “man without fear,” but that has always been something of a misnomer. He obviously feels fear, but after a life of acting as if he doesn’t, resisting that fear seemingly sets in motion a deeply rooted automatic response. Here, it gives Matt enough of a push to snap out of his mental paralysis. At this point, it’s easy to suspect that Matt has successfully broken the spell, and throughout much of the rest of the issue, it appears as if he’s gone back to his usual self, mostly unscathed. Kirsten is suspicious though, and in a beautifully illustrated scene between her and the beaten Matt who shows up at their office, the creative team skillfully handle Matt’s shaky mental status. In a couple of panels (I’ll definitely have to get back to these) showing Matt’s face, as Kirsten gently prods him to find out how he’s holding up, Samnee hides Matt’s eyes from the view of the reader, while the rest of his face shows first hesitation, then a smile. It initially reminded me of the many years of Silver and Bronze Age Daredevil where artists would go to ridiculous lengths to hide Matt’s eyes from view. Of course, Chris Samnee has never shown any such tendencies, and here it becomes a clever way to hide Matt’s emotional state. He may be smiliing, but it is clearly half-hearted, forced, as if he’s following a script he’s written for himself. Still, Matt throws himself into his Daredevil duties and goes to find the children who are clearly in danger from their purple psychopath father. 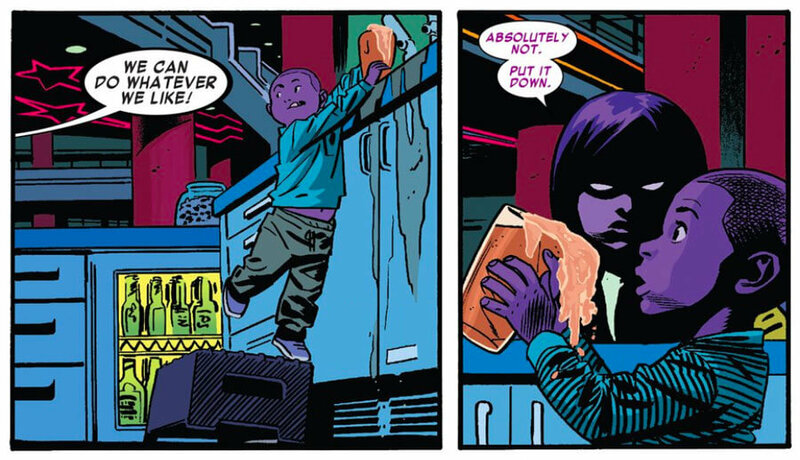 Both Chris Samnee and colorist Matt Wilson seem to enjoy themselves in the bright and chaotic arcade where the Purple Children are roaming around. Samnee gets to use his fantastic ability to convey human emotion with charm and humor to full effect, and the result is touching. The two panels below are two of my favorites of the issue. On the left, Matt is reaching out to a frightened child by alleviating his fears with an impromptu game of peekaboo. On the right is a touching look at that same child holding on to dear life coupled with a very visually striking profile of Matt putting his mask back on. The dark shadow across his face contrasts with his unnaturally bright eyes, and the end result is very cool-looking. While the wrap-up of the Purple Children plot is well executed and resolved in a very satisfactory way, the biggest strength of the issue is the last few pages, in particular the very last one. This is where everything that went before is put into perspective. Until Matt leaves Kirsten to retreat to his bedroom, the reader is left wondering just how much of the despair of the first few pages will actually matter by the end of the story. Of course, we all know that Matt has deep-seated issues that he doesn’t want to let on, or even admit to himself, but we’ve known this for the entirety of Waid’s run on the book. Would this arc end up being just a reminder of this state of affairs, well-executed as it might be, or will Matt finally be prompted to do something? This is why the final page feels so incredibly important. 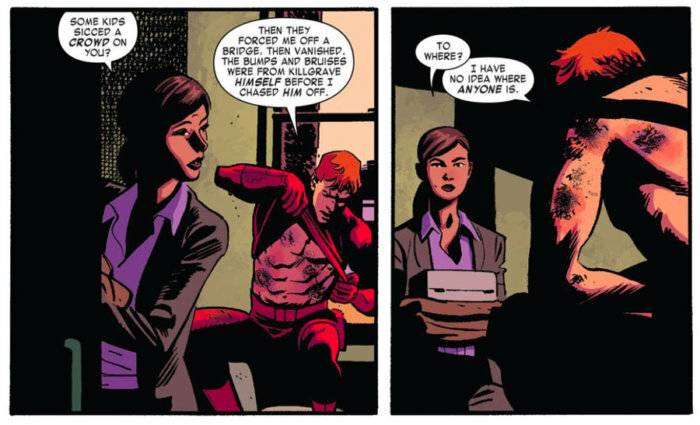 Matt finally decides to do something that any longtime Daredevil fan will know is extremely difficult for this particular character to do, and that is to actively reach out to someone and ask for help. Daredevil has always been a fiercely independent character. He shuns most teams, likes to do things on his own, and usually handles difficult times by pulling away rather than reaching out. When Kirsten thanks Matt for letting her in, those words feel incredibly significant. Interestingly, it also represents something of a turning point, as Matt’s own definition of depression, at the very start of the issue, includes the inability to reach out to those trying to offer support. Matt hits rock bottom at the beginning of the issue, but by the end of it, he’s making a move that is clearly a step in the right direction. I’ll be very interested to see what this will mean for these characters going forward, for however many issues remain of the Waid/Samnee run. The entire team deserves a big round of applause for this issue. Wilson’s colors are an amazing complement to Samnee’s line art (and I’m not sure what exactly he’s done to the shade of Kirsten’s hair, but it looks amazing). Joe Caramagna’s letters are always good, but they’ve had even more room to shine over the course of this arc. Waid’s characterization is perfect here, as is the pacing, and the way the pieces of the story all fall into place by the end. This was just an all around wonderful issue. I’ve always loved Daredevil, since I was, fourteen, I think. Definitely since before Matt had been portrayed with depression and long before I was ever diagnosed with it. I know Mister Waid has spoken about his depression and I wonder if we’re seeing the writers fight here, if only a little. I’m certainly seeing some of mine. What to show people, what to hide, the struggle to even move. I needed this issue today, what an issue! Artistry on all fronts, action, structure (those last two pages killed me), Samnee and Wilson at full speed and, crumbs, check out the the lettering! Great review, Chris, and if any of the DD creative team read this, cheers guys, and thank you. Maybe Matt and Kirsten’s firm wouldn’t be suffering as much financially if she wasn’t paying to have the door repainted every day to perpetuate an ongoing joke that wasn’t funny the first time. That aside, yes this issue was fantastic. 9/10. One of Mark Waid’s best. Samnee as always knocked it out of the park. 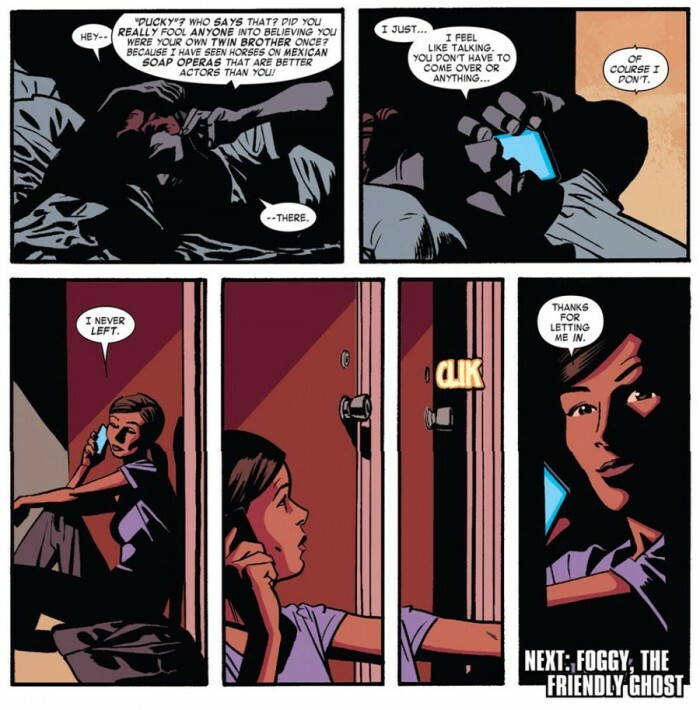 Now I’m about to throw out some criticisms not necessarily of this issue, but things this issue really made me think about in regards to Matt and Kirsten as they have been presented in Waid’s run up until now. This issue was the first time Matt and Kirsten felt like a “real” couple. It was great. As others have said, that those last two pages were magical. This has been, to me, an underlying problem with Waid’s run throughout. Up until this point Matt and Kirsten’s interactions have mostly been based around jokes and quippy one liners back and forth. Matt and Kirsten often have come across like Leonard and Penny from the Big Bang Theory. To further the TV analogy, Matt and Milla when they were together it was like Don and Betty Draper on Mad Men. Even Matt and Dakota had that depth of character where they felt real. There would be page after page sometimes of them just talking to each other, really talking to each other like real people do and it was always good. I don’t dislike Kirsten, this issue made me like her more, but if the next writer completely dumped her character from the book I probably wouldn’t care. Up until now she’s mostly been a device for humor. Again, to me, there’s just nothing there to hold on to, whereas to this day I still miss Milla and Dakota and really feel their stories were left unfinished. If all of Waid’s issues had been even half as good as this I’d be much less ready for him to depart the book. Unfortunately that hasn’t been the case. He’s been hitting home runs about 75% of the time. The last three were great, which means the next issue has a better than average chance of being a foul ball. basically, if you’re not worshipping the ground kirsten mcduffie walks on, you’re doing it wrong. Most of those points, the ones that aren’t specific to a certain situation like the ridiculous scene with her bosses can describe any girlfriend of any superhero. SImply replace “lawyer” with whatever profession the girlfriend has. Or she keeps “Green Lantern’s” secrets. Fantastic review. I’ve found this site recently, and have really been enjoying trawling through all the archived analysis. Going into this issue in particular, one point I thought I’d add, which I didn’t even notice until I looked at the panels you posted in the review. You talked about how past artists have been uncomfortable about depicting Matt’s blind eyes. One thing that’s interesting is, when he’s comforting the purple kid by taking off his mask, he closes his eyes. Then he opens them again once the kid is hugging him and can’t see his face. Is this a little detail to show that Matt Murdock is conscious about not wanting to freak the kid out with his eyes? @John: I think you’re absolutely right. I didn’t even think of that, but it makes total sense. He obviously doesn’t want to spook the kid. Ok its been awhile since I posted, and I know I am incredibly behind, but I finally read issues 9 and 10 tonight and I felt compelled to write something. Its official I have to be alone when I read these issue because if anybody saw me they would think I was a crazy person. While reading this arc I cringed with fear, was taken back by revulsion, laughed like a giddy schoolboy, cheered, punched the air with the action, and by the end had tears in my eyes. What wonderful art! Waid’s portrayal of real world issues like cancer, and depression are amazingly well researched and thoughtfully portrayed. I have already mentioned how the cancer plot has hit me and resonated with me, and by reading the letter column, its plain to see that the recent issues dealing with depression have had just as big an impact on the readership. The opening scenes of pure black panels with Waid’s take on depression being a parasite that paralyzes and numbs the victim were powerful and I am so glad that this experience had a lasting effect on Matt throughout the issue. Although the idea that Matt used fear as his enemy to focus on and begin to break the paralyzes of depression was a brilliant idea, and very in character for Matt and his experiences. It also made it hit him how bad the condition of depression is when besting fear is only the first step in beating the monster that is depression. Im thrilled that these issues like cancer and depression are seen as long term problems that will never really go away in the comic just as they are in real life. These are conditions that once diagnosed are constantly on your mind and have to constantly be fought. I have said it before and I will say it again; the people fighting these diseases are people without fear!!! And the fact that the last page of this issue gives such hope is amazing! Just as one of the letters said, if these comics make even one person feel better and gives them hope then these comics are making the world a better place! I loved the final page!! The fact that the letter page and the DD sign was in between just made it even more of a pleasant surprise. As was mentioned above, I really needed this. I also agree that this issue added a lot to Kirsten’s character and we should all be so lucky to have someone this caring in our lives! As always the art and pacing in this issue was amazingly good. The art could tell the story without words. Chris Samnee is definitely a co-storyteller with Waid. I really wouldn’t say that often, Mr. Samnee truly has a gift for displaying emotion in his work. And the colorful pallet of this comic only serves to heighten the emotion conveyed. Just a beautiful book top to bottom! I am really going to miss this creative team! I have come to the realization that I read to many comics, but its books like this that remind me of their potential. This book, along with Hawkeye and Saga and a few others, is a title with great characterization and very sophisticated plots, and possesses a depth and weight of emotion, but in the end remains a fun and hopeful book. Then , well, I had a perforated ulcer and three weeks off work and well, I seem to have read through the Bendis and Brubaker eras, skipped Shadowland, and am now on Waid and just finished 10 of the second numbered series (wtf, repeater). I was a born and bred Miller fan, adored the Bendis run and worried a bit about the prospect of Waid, who I remembered liking on the Flash, but.. A lighthearted take on Daredevil? How was that gonna work? And then of course I started reading it and like a lot of people, it spoke to me. Because I could see , from the start, the effort , the determination, it took Matt to be upbeat, to carpe diem to want to live. Because I have been chronically depressed for over twenty years and there are parts of my life if has destroyed ( relationships) but parts where I have fought to stay afloat, even excel ( career) , and, well, then I got to the last page of 10. And I CRIED. sobbed even. I don’t think I’ve ever read anything in a comic which has hit me with a tenth of that much emotion. That much empathy for my own condition, and how to keep fighting it. I dont think I ever dreamt Id actually shed tears over a comic. And it wasn’t just the sentiment, but that this was DAREDEVIL! the man without fear, the hero and the lawyer and the stud, and there he was, just as bedevilled as me. Oh clever clever Mr Waid. Well I just wanted to say that , and your site was there. Mr Waid if you’re out there, that was a fine thing you did.